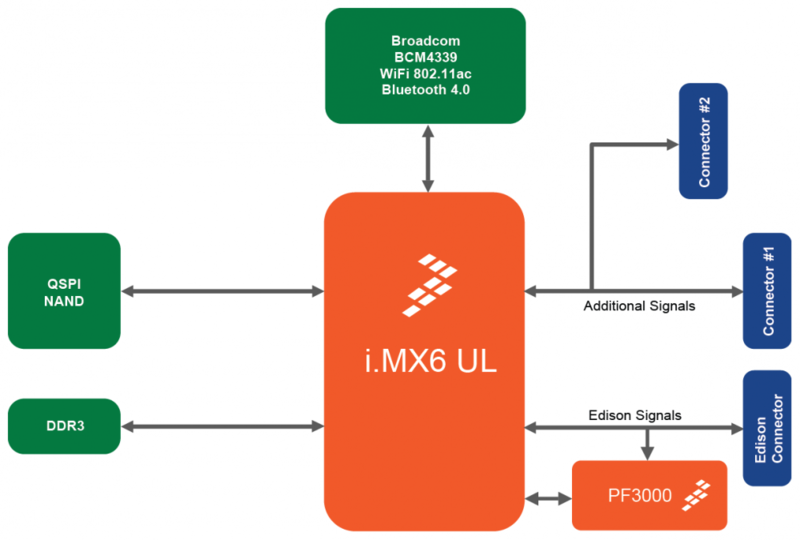 The PICO-IMX6UL features the i.MX6 UltraLight (i.MX6UL) application processor by NXP. The i.MX6UL is a high performance, ultra-efficient processor family featuring an advanced implementation of a single ARM® Cortex®-A7 core, which operates at speeds up to 528 MHz. The i.MX 6UltraLite applications processor includes an integrated power management module that reduces the complexity of external power supply and simplifies power sequencing. On the PICO-IMX6UL the CPU provides a DDR3 memory interface as well as NAND flash or QSPI NOR flash memory and a wide range of other interfaces for connecting peripherals such as WLAN, Bluetooth™, GPS, displays and camera sensors. The SoM is compatible with Intel Edison baseboards and adds a number of additional high-speed signals.